The City has received a federal funding commitment of nearly $1 billion for the Valley Line West. Through the Investing in Canada Infrastructure Plan, the Government of Canada is providing approximately $948 million for the Valley Line West LRT, adding to the approximately $1.04 billion funding commitment from the province in November 2018. The City will now seek to finalize municipal funding requirements and present them to City Council for consideration this spring. These funds allow the City to continue moving forward with procuring the contractors to extend the Valley Line by 14 kilometres from downtown to Lewis Farms. Once all the funding is in place, it will take about 1 year to select a contractor for the Valley Line West LRT project, and another 5 to 6 years to complete construction. 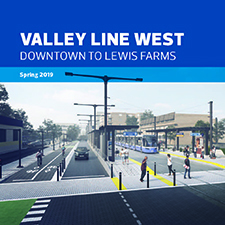 The Valley Line West LRT project has entered into procurement which involves undertaking a rigorous competitive process to select a team who can effectively deliver the project. Valley Line West will be delivered using a design-build-finance-vehicle (DBFV) delivery approach. This type of contract requires the selected team to carry out the final design, construction, integration with Valley Line Southeast, and vehicle procurement of Valley Line West, as well as provide partial financing for the project. Please see the Valley Line West Procurement Fact Sheet and Transforming Edmonton for more information. 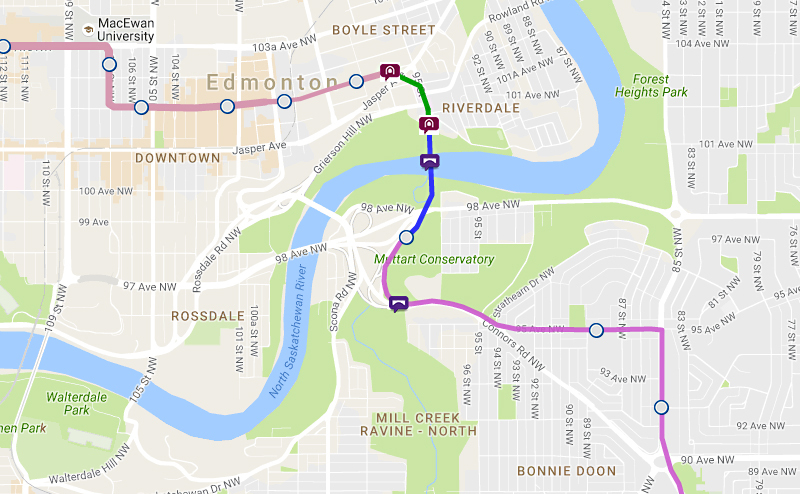 It’s the second stage of the Valley Line, an urban-style 27 km line that will operate between Mill Woods in southeast Edmonton and Lewis Farms in west Edmonton. Learn more about the history of public engagement or the project. View our 360-degree virtual reality video of the Alex Decoteau stop on the Valley Line West route. See first-hand how the Valley Line LRT will transform communities into more walkable, street-oriented places for people to live, work and play. What is Sustainable Urban Integration (SUI)? With direction from the City and two years of public consultation, an extensive list of LRT Design Guidelines for Sustainable Urban Integration (SUI) was established. What is Property​ ​Acquisition and Expropriation? Why is the LRT designed to run primarily at street level, and how is it made compatible with car traffic? The Valley Line LRT is designed to meet the overall goals of LRT expansion while fully integrating with the communities it serves. The low-floor, urban style LRT allows stops to be small, basically a raised curb and sidewalk with a shelter. Stops can be spaced closer together, making LRT accessible to more people. It costs less than elevated or subway systems. The Valley Line LRT will run alongside traffic in designated lanes and follow the posted speed limits. The LRT will cross through an intersection during a green light and stop at a red light, just like the other vehicles on the road. The LRT may get green light priority at some intersections, but because no crossing arms will be lowered, cross-traffic won’t have to wait additional time before and after the LRT passes. As a result, increases in wait times are usually minor. Another benefit of keeping the LRT at street level is that no overhead structures or tunnels are required. Going above or below street level creates visual and physical barriers in the community that reduce comfort and accessibility for pedestrians and cyclists moving through or within the area. When is above or below street level considered? There are some locations where going above or below street level are required. For instance, on Valley Line Southeast, the LRT crosses CP and CN train tracks. Due to rail safety requirements and technical difficulties with having LRT tracks and train tracks intersect, the LRT has to go above or below street level for these crossings. At other locations, street level crossings are incompatible with the style of road. For example, going above or below street level is required when an LRT crosses over Anthony Henday Drive or any of the streets in Edmonton’s “inner ring road”; Whitemud Drive, 75 Street, Yellowhead Trail and 170 Street. Going above or below street level is also considered where traffic volume is already causing intersection gridlock and there is no other way to provide relief. Why not elevate or tunnel the entire LRT? A fully elevated or underground LRT would be inconsistent with the City’s vision, and it would be very costly. This higher cost would result in a much longer time to expand the system and realize the benefits. What would going above or below street level involve? Going above street level would require a bridge over the intersection for the LRT vehicles to travel on. The bridge is called an elevated guideway, and consists of a single deep beam that supports the weight of the bridge, LRT vehicles, snow, rain, wind, and so on. The elevated guideway ramps up and down for about two blocks on each side of the intersection to get to its required height. It is typically supported on large concrete piers centered below the beam, but sometimes may need to be supported on a second layer of deep beams that span across the road onto concrete columns. Due to the close proximity of the elevated station at West Edmonton Mall going underground is not considered feasible at 178 Street. Because an LRT stop can’t be placed on a slope, going above or below street level would usually mean that LRT stops intended to be placed near the intersection would need to be either shifted further from the intersection or built above street level as well. Building above or below street level would be a departure from the City’s vision for a sustainable, urban, integrated, low-floor LRT system designed to blend into surrounding mature communities. An elevated crossing would be more of a visual and potentially physical barrier. Building above or below street level would involve extending the tracks above ground from the elevated West Edmonton Mall station westward to cross over 178 Street and ramp down to ground level east of 182 Street. The 182 Street LRT stop is far enough away from 178 Street that it would probably be unaffected. How are travel time savings calculated? Travel times are calculated using transportation modelling software to measure travel times for vehicle, LRT and traffic congestion. If plans for Valley Line involve LRT priority is removing them an alternative to going above or below street level? Plans call for partial priority for the LRT at some major intersections where the green signal can be extended slightly to allow the LRT to pass before it turns red. However, the LRT may still get a red signal that will require it to stop. The assessment includes determining if a reasonable balance of intersection movements can be achieved. With federal and provincial funding now in place, the City can move forward with procurement which involves undertaking a rigorous competitive process to select a team who can effectively deliver the project. It will take about 1 year to select a contractor for the Valley Line West LRT project, and another 5 to 6 years to complete construction which is expected to begin in 2020. Note: All images and renderings remain subject to change and are not final. Final designs will be shared publicly when complete. Download or view interactive map.